We have created a brand new blog website for all of our updates and adventures, as well as photos and gossip from our exciting shows! Click “HERE” to visit our Azure Entertainment Blogspot site, and add us to your RSS feed! Lucha Royale wins Perth Now People’s Choice Award! 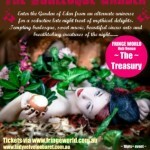 Tickets on sale now for Lady Velvet Cabaret’s “Burlesque Garden” show at Perth Fringe World! Tickets on sale NOW for Lucha Royale – Fringe World Edition! LUCHA ROYALE…..FRINGE EDITION! !